Since getting my supersweet 2006 Roadskater.net jersey last fall, I now have exactly one really nice cycling/skating jersey. (The blue one that I'm wearing in my avatar image was borrowed for the photo. I only own a leafy green one.) I was riding last Saturday and noticing how comfortable it was on a warm and humid almost-summer late morning, and entertained thoughts of getting one or two more good ones to be able to accomodate workouts on back-to-back days and such. Now unlike many of you folks, I'm anything but artistic. My sense of visual aesthetics isn't the greatest and the many choices of jerseys offered seem pretty overwhelming. But looking around got me curious about what others like and don't like in jerseys, particularly what your opinion might be about appearances. Do you like simple designs like solid colors and two/three-tone panels, or something busier than that? Bright colors or muted? Lots of text and/or logos or not? Only logos for events that you've participated in or teams or clubs that you've belonged to perhaps? Licensed designs like pro cycling teams or college sports affinity jerseys? Do you concern yourself with coordinating colors with your bike or skates or other equipment? Or do you not care much how it looks as long as it fits and feels good? I thought about starting a survey on this but the multiple-choice-ness of it makes it hard. So I'm just putting the questions up and I'll see if anyone cares to answer. Submitted by maggie may on Mon Jun 25 2007 11:35pm. Count me as an in between, Tim, with a preference for two-tone jerseys with an accent color. My blue and black roadskater.net jersey is my favorite by far, and the design lends itself to a color update year after year. I wonder what Blake has in mind for this year's tour. Pink, please. Submitted by eebee on Tue Jun 26 2007 1:19pm. Consequently I would run screaming whenever anybody suggested I wear a bike jersey to skate in. Pockets just weren't that important. Luckily Blake knew what he was doing when he created and ordered the RSN jerseys. I bought and wore one because I knew how much he agonized over each tiny detail. Boy am I glad I did that! Skating in any other material now seems so cumbersome, and the RSN jersey colors are eye-pleasing to me. I prefer a simple visual, to busy/messy. I have zero decorating/sense of style genes but I do appreciate the simple and uncomplicated where looks are concerned. I loved this year's Tour de Kale jersey in 'Swedish' colors: Bold blue and yellow (hanging up in the background of the photo). Simple enough for me. As for fit and comfort, the RSN jersey feels as light and breezy as tissue paper, even when drenched in sweat! It's incredible. No room for a pack of dogs around the waist, either, and due to the light material, the jersey falls into place, sitting nicely on the hips. Which is more than I can say for the other clothes I own! I prefer a club jersey or skinsuit, as I would feel like a phony wearing Empire Speed or K2, if I hadn't earned a place on the team out of speedskating prowess. But that's just me - I don't think that about others who like to wear big name designs. I did enjoy wearing a vintage Tour to Tanglewood jersey at the Miami Great EsSkate one year, for the interest it generated in the Tour. However, the cut and design brought me back to Sir-Walter-Raleighville again. Click here for a funny photo. Maggie May, if a pink RSN jersey happens, I will buy myself these skates purely for looks. There must be a way to get a bright pink bike frame & flubber-colored bike wheels, too! Having said that, bright green wheels'll complete the look with the green RSN jersey. Think I'm gonna hafta buy some. Submitted by roadskater on Wed Jun 27 2007 4:42pm. Check out these frames! I found this by looking in the "most watched items" at the bottom of the RSN2 page. http://rover.ebay.com/rover/1/711-6294-2978-0/1?PID=1939263&AID=10381315... Of course they'd get pretty trashed pretty fast but they'd be fun while they lasted looking new, right? Ha! Who cares how they feel or how well they work for you! I understand. The blue side of purple hits me right. Submitted by timv on Wed Jun 27 2007 4:43pm. I kinda expected that few folks would describe their preferred jerseys as "bland" or "tacky," so the subject line above was a bit of a joke. But with so many different styles on display at a given event, many of them looking either bland or tacky to me, it's good to get some insight on what people view as "in between" and why. I appreciate the comments. I gather from Blake's comments that he's put a whole lot of thought into each year's body color choices, and has been very careful to try to pick one that wouldn't offend too many of our sensibilities--especially so for colors that might seem too girly for the manlier among us! 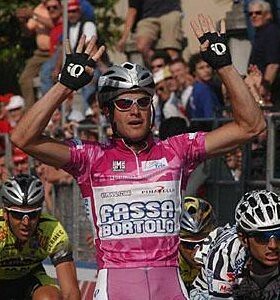 and the more purpley pink maglia ciclamina for the best sprinter, the leader of the points competition. 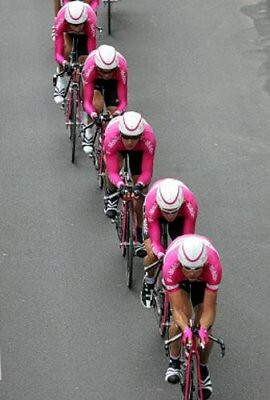 And the T-Mobile team's jerseys can look Pepto-Bismol pink in the right light. I'm not super pink-phobic myself, but I'm not all that convinced that it would be terribly flattering on me either. 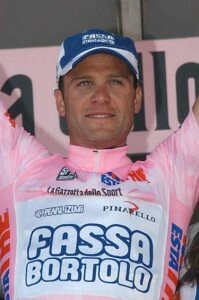 As Blake said, I've suggested an orangish morning-sun red, something like the Euskaltel-Euskadi team color perhaps. (And this is the most musical of cycling team names: "Euskaltel-Euskadi, life goes on, on, la la how the life goes on.") But I just ordered a sunset red adidas jersey from Nashbar, so maybe I'll be satisfied with that. In any case I'm willing to let Blake consider all the factors and I'll go with whatever he decides on. Submitted by timv on Wed Jul 11 2007 3:04pm. The sunset red adidas jersey that I mentioned above arrived last week and has already gone back. It was very light weight as advertised, but was also one of the most ill-fitting and uncomfortable jerseys I've worn. I think the biggest part of the problem was that the zipper was too stiff and heavy for the extremely thin fabric. It distorted the shape of the whole front of the jersey and made the collar stick into the bottom of my chin instead of laying down. I was disappointed. I have a fair amount of adidas stuff that I'm very happy with and this jersey wasn't exactly cheap (by my bottom-feeder standards at least) and I expected better. So I'm back in the camp of wanting something in the range of golden yellow to sunset orange for this year's RSN jersey. But as above, it's Blake's call and I'll go with his choice. I'm sure that he'll choose wisely. Submitted by roadskater on Wed Jun 27 2007 2:30am. Great thread, timv. Kind of cool to get some of those late night Steak'n'Shake conversations moved over to the web. How many are there? Tube guitar amps, reflective stickers, guitar everything, lyrics, exercise and training, open source software projects, the old days of Commodore 64/Atari/Apple IIc, much more. Anyway, I'm not too prolific right now wordlike, so I dug up some old comments here on roadskater.net's rsn2.com. So here are some links, below. One thing I was thinking tonight is that I love cathedral windows, with all their colors brightly shining through the framework of the stained glass leadwork, looking from the inside during daylight, and from the outside at night if backlighted. The jerseys I do for Roadskater.net for awhile will likely have this same or similar design, and I'll be using colors from sky, trees, flowers (maybe even dirt or coffee beans). I guess this could be most colors, but my idea was to someday see a bunch of us wearing the colors we like but clearly still being part of a team of some sort. Some days we might have the "blue" memo, but on many events we'd just wear our favorite color of the same basic design and make up a field of flowers and sky and trees (and dirt?). Crazy ideas I guess, but that was it. So I fretted a great deal over a design hoping to be able to stick with it for a long time without being sick of it. It helps a lot that it's wonderfully comfortable fabric with a super-sweet 19" zipper. I have had 2 or 3 ideas in mind since before last year's jersey came out, with one a favorite in my mind, but it's interesting to hear what people want (even if I ignore it, ha). So far it sounds like 2 pink votes and timv probably a red/orange (similar to last year's Vibe jersey from the Tour to Tanglewood in color) sunrise or sunset. No matter what I do, some will love it, others hate it, so I'll probably try to get together an order for the original color as well before too long. Of course I've been saying that for awhile now, sorry.